When Karl Marx wrote Capital, it was the crowning achievement of a lifetime spent in political and theoretical struggle. Published in three volumes, with a further three books on Theories of Surplus Value which taken together constitute the fourth volume, Capital runs to thousands of pages. It is a complex set of interrelated arguments that show that capitalism arises only at a particular point in history. The stress on historical specificity is to differentiate our society from any that might have previously existed, or that might exist in the future. It is a critique of the previous best attempts to explain the laws that shape capitalist development by political economists like Adam Smith and David Ricardo. Capital was the product of decades of intensive study spent firstly on investigating and uncovering the essential development of capitalism and then considering how best to present his findings. Marx’s theory, though not simple or easy, was only difficult because it was trying to explain a complex reality; he was in his life the strongest opponent of obscurantism. It is the sheer length and complexity of Capital that mean very few people have actually taken the trouble to read it carefully. This means Capital must rank as one of the best known but least read works ever published. Most of us will have gleaned what we know about Capital through commentators or interpreters. And there lies the problem. Marx’s explanation of capitalist development is so far removed from conventional accounts of how our society functions, that it is particularly difficult to appreciate within the Anglo-Saxon tradition. For example, American and British philosophy departments prefer to teach about the thinkers who have proceeded from the viewpoint of the isolated contemplating individual rather than those philosophers who take a broader, more objective perspective. So Descartes, Kant and Leibnitz are paid far more attention than Spinoza or Hegel. This is not a coincidence, as the viewpoint of the isolated individual corresponds more closely to the real surface appearance of how we relate to our society. The ideals of opportunity, meritocracy and self-reliance are very powerful ones that we believe our society should live up to. Even if our society falls short on these ideals, it is still expected of each of us to make what we can of our lives. The viewpoint of the stand-alone, self-determined individual is the default setting for anyone considering his or her place in our capitalist world. This means any analysis that is not based on this subjectivist attitude will seem counterintuitive. The philosophical ideas that dominate our society and frame our thinking are those that accompanied the birth and rise of capitalism. These ideas, embodied in the industrial and scientific revolutions, were those of mechanical materialism. If one looks at most metaphors used to explain anything, they tend to be mechanical in character. So being compared to readily understood everyday physical objects like trains, guns, bullets, clocks, doors, windows, lenses, platforms, pendulums, shelves, ceilings, bricks, etc. makes the unfamiliar thing to be explained more intelligible. When looking at social phenomena that are constituted by people, we can get only so far in using mechanical metaphors. As thinking beings, we are not reducible to, for example, cogs in a machine–our subjectivity also has to be accounted for. Organic metaphors can be more useful in that they capture unfolding possibilities. So understanding societies as developing seed-like, with growing complexity as they mature, is an improvement, as long as one doesn’t push the parallel too far. There is no predictable fixed outcome that societies are definitely heading towards. Unlike a seed, we can influence our form of development. This is the importance of dialectics, looking at objective social processes constituted by beings with subjectivity and consciousness, namely us. Trying to make Marx’s ideas correspond with our commonsense notions often leads to many problems in getting to grips with his work. To understand Marx is initially to plunge into an unfamiliar mode of thought. It is to think historically and (that much abused word) dialectically. One cannot hope to grasp the meaning of Marx by simply applying rules of formal logic such as the law of the excluded middle. This is the idea that something either is one thing or it is not; it cannot be something in between. This binary opposition of mutually exclusive categories has the merit of simplicity, but unfortunately, being static, it is not that useful for understanding real social phenomena. Dialectical thinking recognises that social development is the process of both unbecoming (moving away from one state) and becoming (towards a different state). So that at any time any social object (e.g. a society) may be both one thing and contain within itself the possibility of becoming other than what it is. A society is made of people who are born into a form of organisation which they have not consciously chosen; however their actions do have the potential to change that pre-given form of organisation. We do make history, but are also constrained in this by the circumstances of how society organises our lives. It takes time, when familiarising oneself with Marx’s work and Capital in particular, to bear this dialectical way of thinking in mind. To look at society as a historically produced entity with its own laws of development and to capture them in concepts which we can understand is a formidable task. To say Marx was a genius for even trying to do this is uncontroversial. Nobody has even come close to matching the scope and detail of his explanation of how capitalist society works. Whether his explanation tells us something valuable or even true about capitalist society is more controversial. It is not easy or straight forward to comprehend Capital in its entirety, and lots of people have got lost in the effort of trying. There are quite a number of commentators on Marx who have failed to see the whole of Capital as advancing a single picture of capitalism as a social system. Andrew Kliman is someone who has studied Marx very closely and believes that the old revolutionary still has something vitally important to tell us about how our society works. He has pulled off a remarkable feat with these two books. Kliman has not simply given us a guide to Capital, but rather has drawn out its central purpose and shown its contemporary relevance. My introduction to the work of Andrew Kliman was through his second book, a few months ago. That book so impressed me with its scale of ambition and its clarity that I immediately ordered his first book. Kliman is a Professor of Economics at Pace University in New York. Reclaiming Marx’s “Capital” was published four years before Kliman’s 2011 follow-up work, The Failure of Capitalist Production. 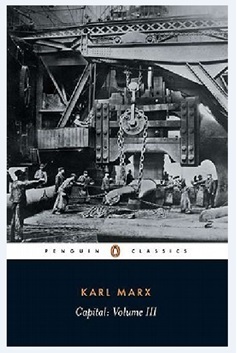 While each book stands alone as a very worthwhile read, I recommend you start with Reclaiming Marx’s “Capital,” as it establishes the foundation for better appreciating The Failure of Capitalist Production. Reclaiming Marx’s “Capital” is Kliman deliberately restricting himself to questions of the theoretical consistency of Capital, arguing that if Marx’s argument can be proved to be self-contradictory, then it can and has often been dismissed as irrelevant. Only once Marx’s work has been acquitted of the charges of internal inconsistency does Kliman move on in his second book to the applicability of using these theoretical categories to explaining the current economic crisis. This review will look at each book in turn. Reclaiming Marx’s “Capital” is an extended treatise on the attacks on crisis theory, with a challenge to those critics and “defenders” of Marx who have misunderstood his work and in so doing have made it seem incoherent. This is important in that Marx’s Capital still represents the most comprehensive critique yet developed of capitalism and the mystified categories through which as a system it is understood. The revolutionary importance of his critique is that, if accepted, then it points to the need to transform society that takes us beyond the anarchy of the market system to one that is organised under conscious human control. A major problem is that many who have claimed to be working in the tradition of Marx have done great violence to the legacy of his thought. The significance of this for Kliman is that when interpreted according to his own assumptions rather than those incorrectly attributed to him by both his critics and “defenders” (who then feel that he needs correction), Marx’s central argument stands as entirely consistent. This is not straightforward because certain passages in Marx’s own work are ambiguous, and picking out what was the intended meaning is contested. 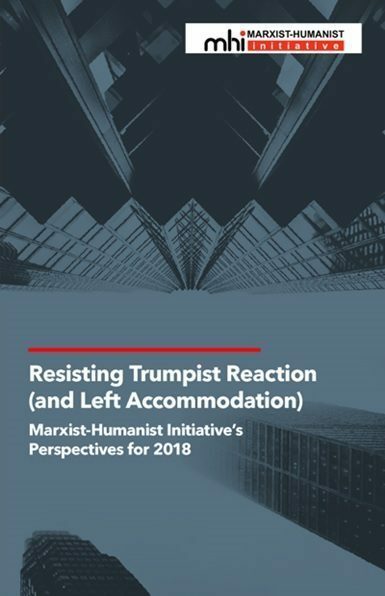 When reading this book, it is immediately clear that Kliman is committed to setting the record straight of Marx being not only personally committed to communism, but of his also giving us a consistent theoretical foundation as to why it is absolutely necessary. Kliman makes this as accessible as possible. He is rigorous in setting out his argument, and given the difficulty and complexity of this material, his writing style is very clear. It is an argument that runs counter to the immediate intuitions of those who might have fleetingly considered the subject. This should not come as a surprise since (to paraphrase Marx) if appearance exactly corresponded to the essence of things, all science would be superfluous. What is perhaps more surprising is that the great bulk of the specialist literature produced on the arguments in Capital, for more than a century, has failed to grasp their full meaning. Kliman’s subtitle for Reclaiming Marx’s “Capital” is “A Refutation of the Myth of Inconsistency.” This book’s target of attack is the variety of misunderstandings of Capital that have led commentators to accuse Marx of inconsistency. The presentation of Capital is based on a series of conscious abstractions (or deliberate simplifying assumptions) in which much of the complexity of the real world, even from his own time, Marx strips away to what is most essential for capitalism’s functioning. Marx’s presentation starts with the “germ” of capitalism, the most basic form in which it can be understood – the simple commodity form. The act of exchanging one good someone produces for a different kind of good made by somebody else, is the simplest possible form of capitalist activity. Even this most elementary form of economic activity contains a contradiction, and as we develop towards today’s established world system of capitalism, the contradiction takes on more and more complex forms. The justification for Marx using abstractions is that they make intelligible what would otherwise be overwhelmingly complicated. This abstraction is an aid to understanding for the reader. As we move through the three volumes of Capital, the simplifying assumptions are gradually dropped, once the primary elements are explained in their interrelationships. Only then, the elements that emerge later and hold secondary importance are brought out. If these secondary elements were to be prematurely introduced it would simply become confusing. Marx’s approach is to look at the contradictions that exist in the more developed form of capitalism and trace the earliest and simplest form in which they could have arisen. He traces what would be the optimal path of capitalist development, one stripped of any detours and accidents that, with our benefit of hindsight, were developmental dead ends. So he looks at real history but concentrates only on those aspects that generate further development. The key is to get the simplest, most elementary stage in which certain forms of capitalist activity arise, and intellectually strip out anything that is merely incidental rather than essential for understanding this. That is the purpose and power of a consciously chosen abstraction. In presenting the accumulation process at these abstract levels, Marx uses tables and formulas (particularly in the “reproduction schemas” in Vol. 2) to show the main dynamic of the system. Only once this necessarily simplified picture is elaborated are the complicating factors brought in. These secondary factors mitigate but do not negate the dynamic of the main elements. It is at these levels of abstract presentation that those who accuse Marx of inconsistency find fault. If Marx’s system can be shown to fall down at this simplified level of presentation, then the more complex picture which is built up from it cannot hope to stand either. Kliman’s purpose is to give a reading of the argument in Marx’s Capital that shows it to be a coherent whole. He is very pointed in making clear in his first book that he is not trying to establish Marx’s theory as true (correctly explaining the real workings of capitalism), but rather the more modest task of showing it as coherent, that it makes sense on its own terms. Kliman’s specific target is the academic and specialist literature since the publication of Capital that purports to show Marx’s crowning achievement as self-contradictory and inconsistent. If the dismissal of Marx as inconsistent can be exposed as based on clear misunderstandings, then it may be possible to create a new audience for his work. The most central aspect of Marx’s thought that Kliman seeks to defend is the tendency for the rate of profit to fall. This most important insight into the workings of capitalism could fairly be described as the main point for Marx writing Capital. Kliman uses the abbreviation LTFRP (law of the tendential fall in the rate of profit). It is critical because once understood, it provides a possible explanation for why capitalism is crisis prone and seems inevitably to lurch towards breakdown. The LTFRP is the expression of how the introduction of labour-saving technology has the effect over time of depressing the rate of profit. Marx’s contention in Capital was that there are specific laws that spontaneously regulate the way in which capitalists accumulate wealth. This is done by advancing a certain quantity of capital used to employ labour (and other means of production such as raw materials, land and machinery) to produce something for market. This product is then sold for more than was initially advanced, and the capitalist increases the size of his capital. This making of profit is both the incentive and motor force of capitalism. As long as sufficient profits are being made, then capital can accumulate and we will have economic growth. If something interrupts this making of profit, then capitalism grinds to a halt. What Marx was able to show was that, based on a modified labour theory of value which posits that because human labour is the source of all value, there is a consistent trend for capitalism to continually undermine the profit basis of its functioning. This arises from the fact that any individual capitalist will try to improve the efficiency of his operation through introducing labour-saving technology. He can for a period either make higher profits by having a more streamlined operation while charging the same price for his product than his now less efficient competitors, or alternatively undercut his competitors on price and gain a greater market share. These technological improvements that mean fewer workers are now required by him to make each item of product, will eventually be adopted by his competitors, thus making this more efficient level of production the new industry standard. This has the effect of squeezing out the living labour that is the source of all profits. This in turn has the eventual effect of lowering the general rate of profit. It is thus, ironically, the profit-maximising behaviour of each individual capitalist that ultimately has the effect of reducing the basis for making that very same profit which they all rely upon. Now the reason why this most important of Marx’s laws of capitalist motion is counter-intuitive, is that we assume that improved productivity which leads to the cheapening of our production process should, for a smaller outlay, allow us to make higher profits (assuming we sell at the same price). We project from this advantage for the individual capitalist and imagine this must be true for the operation of the whole economy. However, in a system based on market exchange, as the labour cost-reducing machinery spreads, there is a general effect of lowering the market price of the finished product over time. This is a peculiarity of how capitalism works because a product’s value is determined by the average time it takes to make that product, and it is around this value that its price will gravitate. The interests of each individual capitalist is to raise their labour productivity (reduce labour time for making their individual product), but this ends up reducing the rate of profit for all capitalists. The underlying pattern of capitalist development is for a rising proportion of the capitalist’s outlay to be on machinery and materials (called constant capital) and a falling proportion on paying workers (called variable capital). This, referred to by Marx as the rising “organic composition of capital,” is the reason that there is a LTFRP, as living workers that are the only source of surplus value and therefore profit are reduced as a proportion of total capital. The LTFRP is not the only tendency in capitalism, otherwise the system would have long since collapsed. The other factors slow and can even temporarily reverse the direction of an ever-higher proportion of constant to variable capital, but these do not ever stop for long the dominant trend of technological improvements pushing to cause the LTFRP and economic crisis. Kliman knows that anyone who is even vaguely familiar with Marx will be aware of his premise of a labour theory of value. He goes on to demonstrate that the many people who have tried to correct Marx’s system of argument fail to use this premise. He painstakingly goes through the variety of ways in which those who say that Marx’s argument is inconsistent are in fact not basing their own arguments on his premise but instead are smuggling in their own differing assumptions. These assumptions violate Marx’s principle that socially necessary labour time is the only source of a commodity’s value and that surplus labour (labour performed by the worker that is not paid for by the capitalist) is the sole source of surplus value and profit. This contrasts with recent ideas such as total factor productivity which hold that living labour is not the only source of new value. Having failed to develop their arguments from his premise,their “improved” interpretations of Marx are always going to be at variance with Marx’s own arguments and conclusions. When reading any text, it is possible to take a single sentence or even a paragraph in isolation from the main thrust of the argument and give it a variety of interpretations. In building his case that those who accuse Marx of inconsistency are mistaken in their interpretation, Kliman establishes why his Temporal Single System Interpretation (TSSI) of Marx’s Capital is to be preferred over all others. 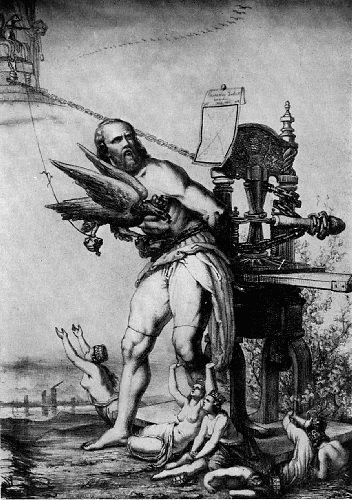 He goes through an argument originally advanced in the field of textual hermeneutics by Frederich Schleirmacher. This states that in choosing between competing interpretations of what an author meant in a work, the one that resolves apparent contradictions in the text as a whole must be preferred to the interpretations of that same text that fail to do this. If there are certain passages that simply cannot be reconciled within a given interpretation while another interpretation can make sense of these passages, then we should reject the former in favour of the latter. This was further developed by George Stigler in a dispute over Ricardo’s theory on the demand for corn. Stigler argued that in selecting between competing interpretations of an author’s own argument, we should choose the interpretation that most successfully derives the author’s stated conclusions from their stated assumptions. It is in using this criterion of the need to understand Capital as a whole that Kliman then goes through the different ways in which those who accuse Marx of inconsistency are misreading what he meant. He argues that all the objections to Marx’s argument that have been maintained for the last 30 years are down to the same root cause, the simultaneous valuation of inputs and outputs in production. A temporal valuation is taking the actual cost of the inputs that go into production as the basis for working out profits and profit rates. A simultaneous (or replacement cost or current cost) valuation is one that takes the inputs that went into production and values them at what would be paid if one were using the same inputs today. Kliman argues that this form of costing is not one that would be understood by anyone in business. More importantly, it is not what Marx would have understood as a cost when studying capital accumulation and the formation of a rate of profit. The book continues with a detailed discussion on the implications of this form of valuation. Kliman starts this by arguing that a physicalist interpretation of Marx is incompatible with a labour theory of value, before showing how simultaneous valuation leads to physicalism. Physicalism is the framework that holds value, price, profit and the rate of profit to be determined by physical quantities. This would include the type and number of machines that make up constant capital or the basket of goods a worker’s wages will actually buy (referred to as real wages). If through technological improvements, these goods take a worker less time to produce, then their cheapening (lower value) will not be reflected by simply counting the physical quantities. In measuring the value of the outputs, the two magnitudes to be measured to get total profit are quantity of items and the profit margin on each item. If the value of the goods is being reduced (by requiring less time to make each item), then the total profit made can only rise if the increase in quantity is sufficient to offset the fall in the profit on each item. If the output value is always assumed to be equivalent to the input value, rather than observed in operation, the increasing productivity over time will be understood one-sidedly as just a higher quantity of output. But this fails to account for the lowering value of each item. This will have the effect of overestimating the real profit and rate of profit. It also would contradict Marx’s LTFRP since rising productivity of labour through introduction of machinery is going to result in a greater quantity of output. But if the fall in the value of the product is not also taken into account, then, of course, one will project an ever-rising rate and mass of profit. Kliman shows how simultaneous valuation of inputs and outputs leads to physicalist conclusions: that a rise in physical quantities produced means greater total value. This diverges from Marx’s insistence that a certain amount of labour time represents the same value irrespective of how much is produced. Higher productivity, for Marx, simply means that the value represented by a certain amount of socially necessary labour time is spread over a greater number of items. There is a particularly impressive section in chapter 6 in which Kliman gives a forensic reading of a paragraph from Marx’s Economic Manuscripts 1861–1863. He quotes a 20-line passage in full, adds numbering to demarcate each separate point being made, then shows why a simultaneous (or replacement cost) valuation interpretation is incompatible with the passage as a whole. He shows why simultaneous valuation interpretation only superficially seems to make sense of part of the passage but flatly contradicts the rest of it. By contrast, when read in Kliman’s preferred temporal manner, then the whole passage is made coherent. The passage in question is one often cited as evidence of Marx being in favour of simultaneous valuation, so Kliman’s demolition of this misinterpretation should have settled this controversy. There are however still radical economists and even those calling themselves Marxists who continue to give a simultaneous interpretation of Marx and call for a modified version of his theory. This book does offer some reasons as to why this might be so, and I’m persuaded by Kliman’s case on this too. The Failure of Capitalist Production argues that the roots of the current economic crisis lie in the unresolved problems of over-accumulation that forcefully emerged at the end of the post-war boom in the 1970’s. This is not an entirely novel insight, but Kliman presents it more comprehensively and he is more combative, than others making this observation, in challenging many misconceptions that have arisen in both left and mainstream commentaries on the current crisis. 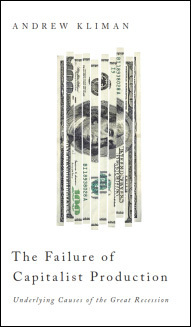 Kliman shows why it is not a failure of policy or regulatory framework that is to blame for today’s economic woes, but rather an integral feature of how capitalism as a system (mal-)functions. He examines not just the main tendency of a falling rate of profit, but also the counteracting influences that have slowed and shaped the trend towards crisis. It is the exhaustion of these counter-crisis measures that are most important in explaining the timing and form of the current crisis. It demonstrates how every effort to compensate for a falling rate of profit (whether conscious or otherwise) ends up reproducing the problems in both a more intensive and extensive way. The expansion of credit and rising debt can mask underlying problems of low profitability and sluggish growth for a time, but these cannot be extended indefinitely before there is a “correction” which affects the whole of society. Kliman’s discussion of the events leading up to the collapse of Lehman Brothers is as lucid an explanation of the unfolding crisis as you will find anywhere. He shows how in response to the sluggish state of the American economy after the bursting of the previous bubble in new online enterprises (the dot com boom), the U.S. establishment were keen to avoid following the example of the “lost decade” in Japan. That decade of next to or no growth in Japan was associated with deflationary pressures caused by a decline in consumer prices. The US central bank (the Federal Reserve), to avoid the danger of deflation and stagnation, maintained artificially low interest rates to encourage business borrowing for the purpose of investment. This, in conditions of low profitability, did not stimulate investment but instead encouraged financial institutions to borrow this extremely “cheap money” from the government and lend it to people who used it to buy houses. As money poured into the housing market it fuelled the housing price bubble. Kliman is very good at drawing out his point that if the Federal Reserve had pursued a different policy, then the crisis would have manifested itself in a different way. Given that the fundamentals of the economy (conditions of profitability) were so shaky, there was no avoiding the crisis happening in some form. Any policy aimed at avoiding capitalist crisis altogether is just wishful thinking. Kliman is at pains to show that even though the LTFRP is the most important law of capitalism, it is not the immediate cause of the crisis. The LTFRP will always generate a response within capitalism which can temporarily abate its effects only to reproduce it later, impacting on wider sections of society and with more devastating results. So this time, sluggish growth due to low profitability necessitates a government response which triggers a housing bubble, which once burst leads to the great recession sending shockwaves around the world. The LTRFP is the underlying ultimate cause of capitalist crisis, but the immediate cause or actual trigger will be different according to how that underlying problem is “managed” in any particular situation. This is because the counter measures never eliminate the LTFRP, which is intrinsic to capitalism’s functioning as a value-producing system. Chapter 4 is an empirical investigation into what happened to the U.S. economy during the 1980’s and 1990’s and the impact of neo-liberalism started under Ronald Reagan, which is held by many to have led to an improvement in performance and growth. Kliman disputes this account, showing that there was no real recovery, and in fact despite the rhetoric used, did not involve the level of restructuring that might hope to facilitate recovery. Unlike some commentators on the left, Kliman does not accept that through increasing the exploitation of workers, U.S. capitalism underwent a revival after the economic shocks of the 1970’s. He shows why there was no marked shift in the share of total national product away from workers to capital. He shows that when including transfers to pay for general goods and services out of taxation, the share received by workers remained remarkably steady rather than experiencing a big drop under and since Reagan. The point of this chapter, which ideologically may be inconvenient for some leftists, for Kliman is just looking at the evidence to get to what is really happening. The narrative of a marked redistribution away from workers towards capital is not justified by the economic data. Instead, it was the slowdown of economic growth that most people experienced as the end of the continually rising living standards they had gotten used to. Nor was there any real recovery of profitability and growth on the back of this non-existent redistribution. The following two chapters, 5 and 6, rework some of the arguments presented in Reclaiming Marx’s “Capital,” showing why there is not a single measure that will give you an unambiguous answer as to what we should consider a rate of profit. Kliman gives the reasons for selecting the data he has and what he thinks it shows. He shows that capital accumulation (economic growth) tracks corporate profitability very closely. It is in these chapters that the theoretical and methodological framework of Marx’s Capital are used in untangling the great mass of economic data the U.S. produces each year. I will not try to reproduce that part of his discussion, as I could not do it justice here. Chapter 7 is a development of the previous two chapters on the rate of profit and its centrality for capitalist growth. He discusses why the rapid development of Information Technology has sped up the depreciation of constant capital. He also explains the development of the idea of MELT (monetary equivalent of labour time) as a way of working out the component of variable capital. It is in offering the evidence for the validity of the LTFRP that he gives a nuanced explanation of many theoretical issues with reference to real world statistics. There is a very good chapter on “underconsumptionism,” which is actually the dominant way in which Marx’s idea of crisis is most commonly misunderstood. Having shown that there was no redistribution of total product away from workers, he goes to show why, if it had actually moved in their favour, it would not alleviate the crisis. Here in the U.K. the trade unions, most of the radical left, and mainstream economists all read Marx through an “underconsumptionist” lens. This is the idea that an insufficient share of the national income goes to workers that can then be spent, creating the demand for goods and services, thus stimulating growth. This radical spin on Keynes “equilibrium” theory of insufficient demand has nothing in common with Marx’s crisis theory. It is the ubiquity of these faulty interpretations of Marx that are a major problem for understanding his work. In Stephanie Flanders’ otherwise excellent BBC series “Masters of Money,” when it came to looking at Marx’s ideas, she attributed insufficient consumption of the masses as his underlying problem of capitalism. In that sense, Flanders saw Marx as a proto-Keynsian with an additional political desire to get rid of capitalism. Kliman, by contrast, is very much in the tradition of the Henryk Grossman and Paul Mattick, Sr. interpretations of Marx, maintaining that the central problem of capitalism is due to the tendency for the rate of profit to fall, caused by a rising organic composition of capital (rising proportion of constant to variable capital). This problem is not susceptible to any kind of redistribution, but rather points to the need to transcend capitalism itself. This book is a brilliant account of the great recession which began in 2008 and continues to this day. It is Kliman’s relentless drive to get to the truth and avoid glib easy answers that makes it such an essential read. It is not that there was a falling rate of profit that continued to the point where U.S. capitalism experienced a breakdown. That simple account, parroted by some leftists, is not supported by the data. It was rather the expression of this tendency up to the 1970’s that left a historic legacy of a low rate of profit. The availability of cheap money and expansion of credit masked the underlying problem for a period. However, the low rate of return on investment left the whole economy vulnerable to shock.When the shock came in 2008 after the previous temporary fix was exhausted, our current difficulties began. There has been criticism of Kliman for concentrating too much on U.S. developments. This criticism is not reasonable, as America is the archetypal capitalist economy, and for now still the world’s largest. America expresses today the same laws of development that Britain did when Marx was writing in the nineteenth century. The examination of the trends shown through U.S. data is not a parochial narrowness but a valuable contribution. (Kliman defends his concentration on U.S. developments on the grounds that the available data is of a higher quality and that the U.S. was the epicentre for the crisis that swept the world.) It should ideally serve as inspiration for those of us operating in other countries. We could do with quite a few more like Kliman. The bar has been set very high for explaining the current crisis. If there were any justice in the world, he would at least be seen as an important reference for all other commentators. He avoids the orthodoxy amongst many radicals for being “practical,” in that he refuses to offer suggestions of how to make capitalism function better. Not for him a drawing out of the contradictions at the heart of capitalism only to join the policy wonks, as though this analysis did not have more fundamental implications. As an implacable revolutionary, Kliman has through his work done a great service to those who wish to understand the world with a view to transforming it.